Synopsis: Ruka raises her mic into the air, which signals that she would continue with her idol career and thus, the video announcement for her Las Vegas concert plays. Atsumari thanks her as she marches off backstage without batting an eye at her agent and looking pretty downtrodden. Meanwhile Dr. Kurosu confronts Hayate and tells him something about Ruka. I am actually a man and am Suirenji Ruka's lover! The revelation is concealed intentionally, but she does tell Hayate that he might be able to make her happy. This is shown in a flashback later on in the Violet Mansion as Hayate talks to Ruka about how he was glad that she didn’t quit singing because he thought that she really liked singing. At this, Ruka breaks down and tells Hayate outright that she didn’t quit singing because she had a debt of 150 million yen. Hayate seems to remember what Kurosu had told him earlier and hugs Ruka from behind declaring that he would definitely make her happy. 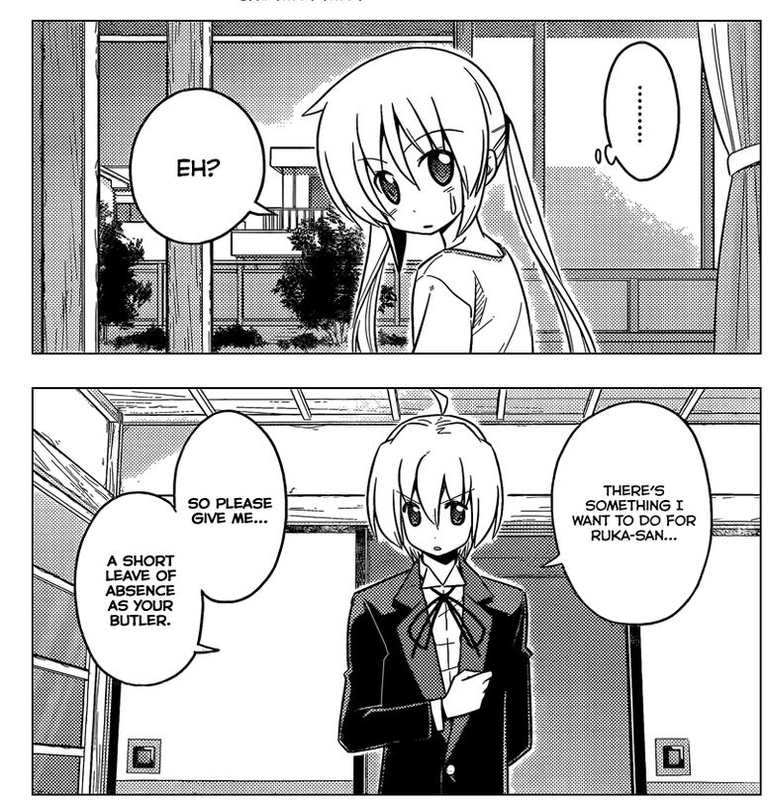 Nagi witnesses this scene as she is excited to show Hayate the finished script for her manga. The scene then moves on to the next day wherein Hayate asks for a leave of absence as Nagi’s butler because he wants to do something for Ruka. Review: This chapter seems to be missing a proper cover -- or perhaps it just hasn't been uploaded yet. In any case, we finally come to the long-awaited continuation of the chapter 413 cliffhanger, and although that part has finally been explained, we still don’t get to see Nagi’s side of the story much. I have to be honest, my heart was racing as I read this chapter as I expected Nagi to have another emotional breakdown. 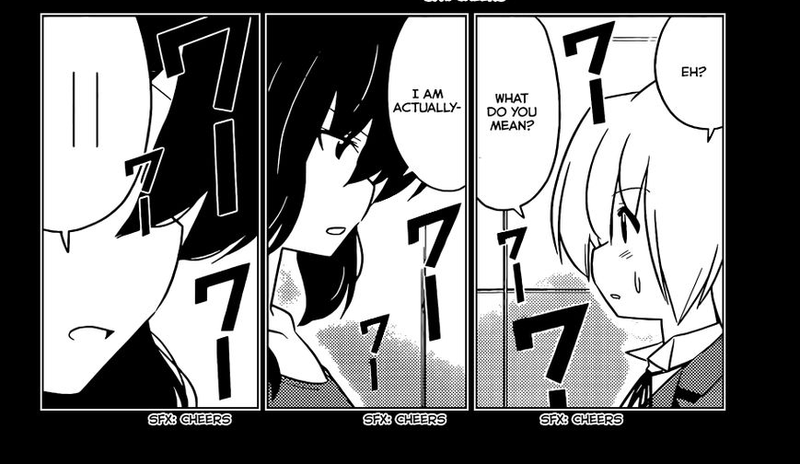 Instead, she still seems to be in so much shock that she doesn’t really react and leaves Hayate and Ruka alone. That’s why it was even more of a downer when that oblivious butler rubs more salt on her wounds and sticks a knife in for good measure by asking for a leave of absence as her butler in order to do something for Ruka. If you don’t feel bad for Nagi after seeing this scene, then you are one heartless person, I kid you not. 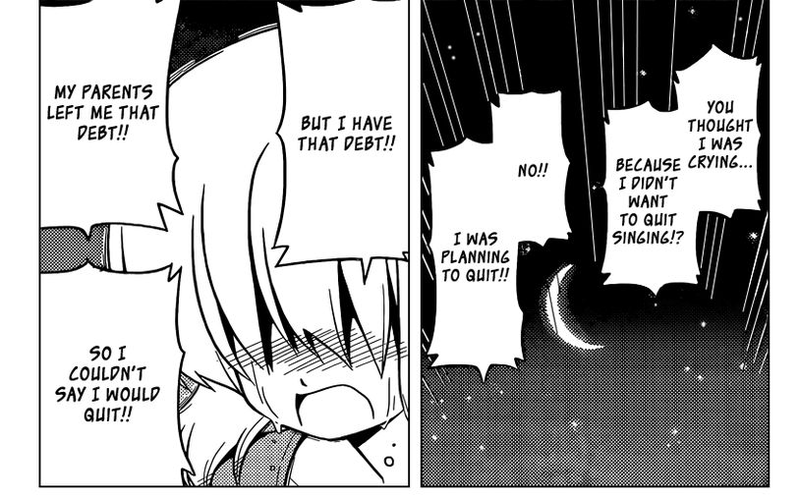 Don't make it worse for the poor girl, Hayate! 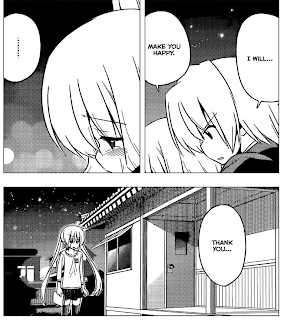 That aside, I actually like Nagi’s reaction or non-reaction in this chapter as I expected her to either break down in tears and run away crying or go the comedic route and revert to her old tsundere ways shouting “Hayate, you cheater!” Instead, this scene further confirms that she is probably already aware that Hayate’s initial confession to her was a misunderstanding – although I can only imagine the emotional turmoil that she must be going through at the moment. I have to say, Hata is being incredibly cruel to his favorite female character. I am not against this kind of development however, since it sets the stage for making Nagi really shine in this arc – perhaps even better than she did in the Can’t Take My Eyes Off You anime wherein she experienced a similar downer – although this one in Ruka’s arc was laregely foreshadowed and comes out as even more traumatic. I can only hope that she comes out of this experience even stronger and more likeable as a character. I don't really like Ruka's apparent reason for not quitting as it just makes her seem even more selfish than she's already been made out to be. If that is the case, then it makes her even more undeserving to eventually win Hayate's heart, but as much as I want Nagi to eventually win, I don't want Ruka to be unhappy or to look this bad in the process since I really like her character as well. I'm not sure what direction Hata is taking with this development, but I sincerely hope that Ruka didn't really mean what she said as it makes her character feel shallow and one-dimensional to me. (I want Hayate and no one else matters, so there!) I'm still hoping that she comes to the realization later on that she actually does like being an idol or that the idol Ruka Suirenji is also a persona of Ruka Suirenji, the girl who has fallen madly in love with Hayate Ayasaki. (Yes, that is a definite Persona 4 Golden allusion). 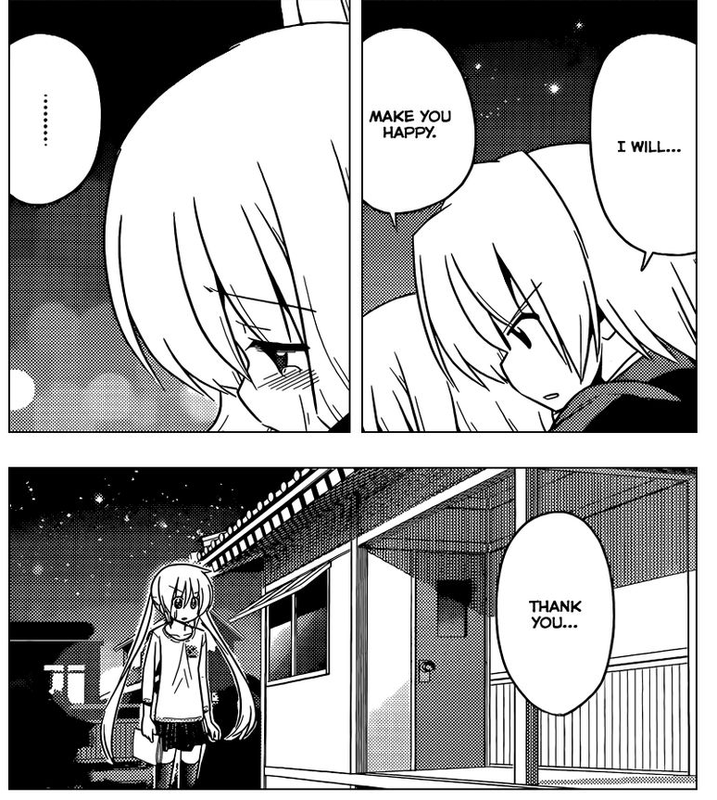 For Hayate’s part, I’m just a bit frustrated at how oblivious he is to Nagi’s feelings even at this point in the manga and the lengths that he is willing to go through out of his casual kindness just to help other people – and how it inadvertently results in hurting other people who are close to him. Brace yourselves for the next chapter, I’m pretty sure that Nagi will agree while keeping her feelings to herself, but I could be wrong. As an aside, it’s heavily implied that Dr. Kurosu might be a relative of Ruka’s – maybe even her mother, but I don’t believe it for one second as Hata has never been one to play his cards straight. Personally, I just hope we don’t get several chapters of Emo Nagi again. As a side note, I like how she was drawn in this chapter.